Jean-Luc Godard’s Weekend (1967) is an outrageous pastiche of 1960s intellectual discourse, fusing together the ideas of Karl Marx, Jacques Lacan and Bertolt Brecht (among others). Along with his cinematic contemporaries, chief among them, Pier Paolo Pasolini and Luis Bunuel, Godard made a very political film, a satire that deconstructed Western civilization and one that anticipated real-life socio-political upheaval that occurred in May of 1968. Labeled rather cheekily as “a film adrift in the cosmos” in the opening credits, Weekend follows the misadventures of Corinne Durand (Darc) and her husband Roland (Yanne). We meet them as they talk with their respective lovers about how happy they’d be if their spouse were dead. Godard immediately messes with convention and our expectations in a scene where Corinne’s lover assumes the role of a psychiatrist while she recounts a three-way she had with another lover. As she goes into great detail, Godard punctuates the scene occasionally with melodramatic B-movie music that threatens to drown her out. Corinne and Roland take off to her family’s house in the country to see her ailing father. En route, they make their way through a massive traffic jam that is brilliantly orchestrated by Godard in one long, uninterrupted take. We see people arguing, animals waiting patiently in a vehicle, two people playing catch with ball, an elderly couple playing chess on the side of the road, and, of course, the source of the commotion – a horrible car accident with the street stained in the blood of bodies lying on the grass next to the road. After the whimsy of seeing people idly passing time in the traffic jam this images is a jarring way to end such a bravura sequence. Corinne and Roland pass through a village where a Marx-quoting farmer argues with a woman whose car crashed into his tractor, killing her boyfriend in the process. Later on, they’re harassed by another automobile accident victim brandishing a pistol. The whole world has gone crazy, consumed by its own excess while Corinne and Roland try to navigate this dangerous landscape. They become immersed in the chaos, clinging to their bourgeois, material possessions. Weekend famously concludes with a title card that simply reads, “end of cinema.” Godard felt that he took narrative cinema as far as it could go and pushed the boundaries to their breaking point. The film is an absurdist black comedy whose legacy can be seen in films like Little Murders (1971) and Natural Born Killers (1994). It’s a very experimental work featuring one outrageous sequence after another. It is critical of both the left (communism) and the right (capitalism), thumbing its nose at their ideologies. Like many young people were doing at the time, Weekend questions authority and this is what makes it as relevant now as it was back then. Writer Kent Jones contributes a video essay entitled, “Revolutions Per Second,” where he talks about Godard’s approach to filmmaking – living in the moment. He examines how Weekend was a critique of French culture and politics. Jones does an excellent job analyzing the film in great detail. There is an interview with cinematographer Raoul Coutard. He talks about working with Godard on Weekend and points out that Mireille Darc was not the director’s first choice for the role of Corinne. He also talks about how Godard did not get along with the film’s producer and shares an anecdote about their contentious relationship while filming Weekend. Actors Mireille Darc and Jean Yanne talk briefly about what it was like to make the film in vintage interviews that look like they were conducted around the time of the film’s release. Assistant director Claude Miller recounts how he was a fan of Godard’s film criticism and his films before actually meeting the man. He talks about how they met and how he got to work on Weekend. 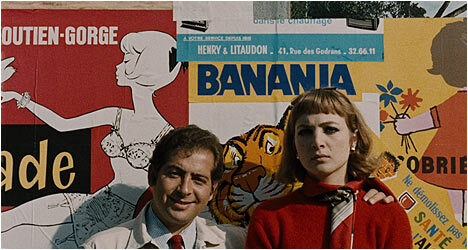 There is an excerpt from a French documentary television series, which follows Godard and his cast and crew as they make Weekend. It is fascinating to see the man at work and get a peek at how he directed a scene. Finally, there are vintage French and U.S. trailers for the film.